There are many joys to having a pet rabbit. There are some annoyances also. Rabbits are always chewing–it’s part of their nature since their teeth are constantly growing in need to wear down. As a result, mischevious rabbits will chew on furniture, baseboards, book spines, electrical wires, and anything else they can get their little paws on. As a rabbit owner, you can counteract this by rabbit proofing your home or the rooms your bunny plays in to protect them from damage and keep your bun safe. 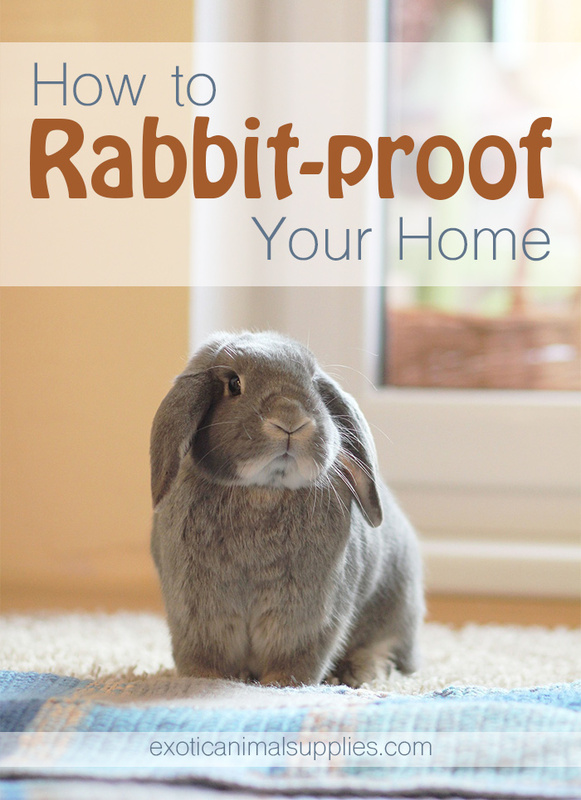 This article will cover everything you need to know to rabbit proof your home. If your rabbit is ever left unsupervised in a space it must be rabbit proofed for their safety. When you are assessing a room for problem spots that need to be bunny proofed, get down on the floor and see the world through your rabbit’s eyes. Look for anything they can chew on, especially things made out of wood or paper. Looking for wires or electrical cables in easy reach of your rabbit’s teeth. Now search for any areas where you rabbit may squeeze into like furniture they can crawl under or behind. Try rearranged furniture or moving items to eliminate as many of this problem areas as possible. For the rest, you may need to do some additional bunny proofing as outlined in the next sections. The first (and maybe easiest) thing you can do is limit your rabbit’s access to your home. This can be done by restricting their access to specific rooms that are not easy to rabbit proof or by limiting the space they exercise and play in. How you do this will depend on your specific home and how much space you want to allow your bun to access. An exercise pen will protect your bunny from any dangers and allow you to maintain a semblance of normalcy in the rest of your home without worrying about making every nook and cranny rabbit safe. If you want to limit your rabbit to certain rooms or keep them out of certain areas of the house, you may find a baby gate works well as a bunny gate. A plastic or metal gate works best, and you should make sure the bars aren’t wide enough that your rabbit can squeeze through them, especially if they’re young or a smaller breed. Try to avoid wood or fabric gates as your rabbit may chew through them and escape. baby gates are great for doorways, the top or bottom of stairs, and hallways. 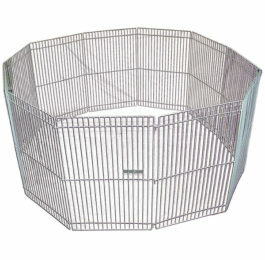 They’re also an excellent option if you’re able to rabbit-proof an entire room for your rabbit to frolick and play in. The gate will keep your bunny in their safe space and protect the rest of your house, too. 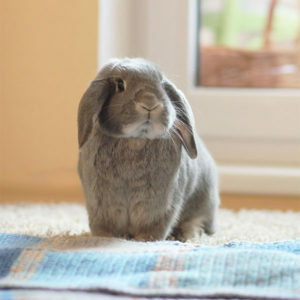 Rabbits love to chew and burrow, so it’s not a surprise that your flooring could become victim to your bun’s “creative redecorating.” The easiest way to bunny proof your floors is to cover them with something. Towels, a blanket, or a tarp are cheap solutions you may already have around your home. Rag rugs are an affordable and easy option to protect your floors. You can easily throw them in the washing machine if they get dirty. You can use any of these as a permanent flooring for your rabbit’s exercise area or just throw them down when it’s play time. Furniture legs, corners, and other edges are tempting for rabbits to chew. Baseboards also look tasty to your bun. If you can’t limit your rabbit’s access to the furniture and walls there are a few things you can try. For baseboards and other flat areas, you can use a rabbit safe wood or cardboard to cover it. Then your rabbit will nibble the wood instead of your baseboards. We recommend stopping by the hardware store and buying furring strips or other cheap (but safe!) wood. They can cut it to size for you. Clear plastic panels (like plexiglass) are another option to limit your rabbit’s access to walls and furniture. For furniture with round legs, you can easily hide them to prevent your bunny from treating them like a tree branch. If they’re skinny enough, a paper towel roll provides a temporary solution that will need to be replaced frequently. For voracious chewers try PVC pipe or a hard plastic flex hose to protect the furniture legs. If these options won’t work for you, consider using NIC Cubes or an exercise pen as a fence to restrict access to the furniture or wall. 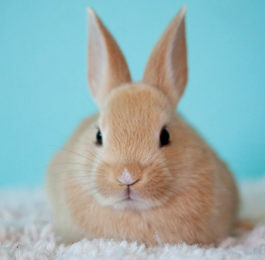 You could even set them up as a perimeter around a room, giving them plenty of space to hop and play, but keeping your rabbit away from walls, cords, or furniture. Rabbit chewing electrical cords isn’t just an annoyance for you, it’s incredibly dangerous for your bun as well! If your rabbit chews on a cable that is plugged in they can electrocute themselves and possibly die. Rabbit proofing any cables and wires in the spaces your rabbit accesses is essential to keep them safe. The first step you should take is to try and limit their access to any electrical cords. 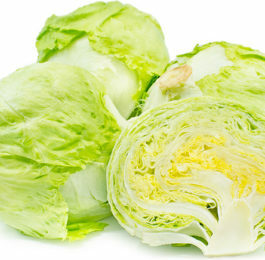 If they can be hidden behind furniture or raised out of reach, that may be enough. Keep in mind that rabbits are crafty and may often find ways to squeeze behind furniture or stand up on their hind legs to munch on your cables. Make sure to check any cables covers regularly for any bit marks and to replace any tubing that is heavily damaged. If your rabbit is still chewing away, you may need to consider other ways to limit their access to electrical cords, such as with gates or exercise pens. If when your rabbit is out for play time they want to hop, explore, and find tasty things to chew on. If you don’t provide them any type of entertainment, your rabbit will make their own fun–often by chewing or destroying things like furniture, carpets, and other precious belongings. You should make sure to provide them plenty of toys and other rabbit fun to keep them busy and distracted from the things you don’t want them to chew. There are plenty of commercial rabbit toys and playsets to keep your bunny entertained. If you don’t have a huge budget or find your rabbit destroys their toys almost as soon as you set them out, there are plenty of DIY options to provide rabbit entertainment. Clean cardboard, free of stickers, tape, or printing make great toys. Empty oatmeal containers or toilet paper rolls provide tossing and chewing fun. You can even make easy DIY rabbit toys from paper towel tubes to add some variety. Cardboard boxes can be used to create houses to explore or dig boxes to burn off some energy. You can even make a fun cardboard box maze with just a box, some scissors, and a little creativity.